What’s going on in University City? Read the February newsletter where we spotlight neighbor Thomas Levy; Girl Scout projects; UC Del Sol softball and UC Little League; vintage video of Governor Drive and other local streets; UC Cars and Coffee; swimming pool opening; Westfield UTC parking fees; local events; UCPG elections; Buy Local businesses; MCAS Miramar flight information planning; advertisers and members; and much more. Due to the rain and wind predicted today and through the weekend, home delivery this month may be delayed. 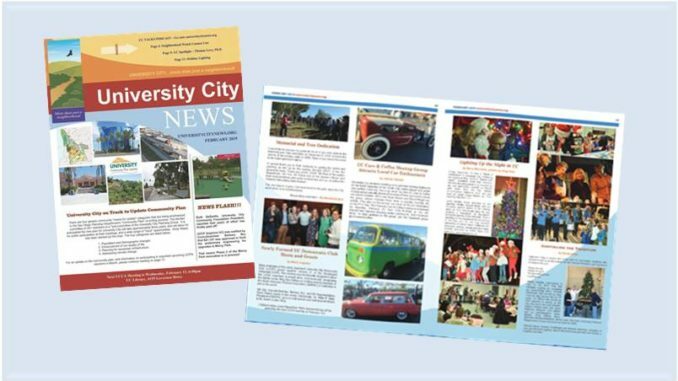 *Print versions of University City News February 2019 are currently available at the Standley Park Recreation Center and the University Community Library, both on Governor Drive. Print copies will be delivered to homes in south University City this weekend and to select locations in University City north of Rose Canyon. Please note: UCCA will be initiating its Podcasts this month. Thanks to all UCCA members, contributors, advertisers and volunteers. We couldn’t do it without you.